I'll assume that blog readers are mostly or entirely unfamiliar with the Alphasmart line. If you already know a lot about them, you'll probably want to skip to the next paragraph. 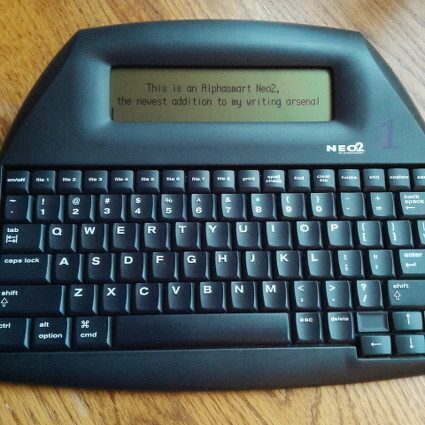 The Alphasmart is basically a keyboard and a non-lit LCD screen, serving as a basic "word processor" -- or perhaps "text editor" is a more apt description. There are eight "files" which are really just memory spaces, and as the user makes changes to a file those changes are continuously saved. There is never a need to use a "save" feature, you can go directly from typing to hitting the on/off button without data loss. The device connects to a PC via USB. These devices were used a lot in schools, although they are no longer being manufactured and schools have largely moved on to small computers and tablets. My oldest child used an Alphasmart in school, but my youngest had never heard of one until I bought mine. Perhaps as a result of the educational target market, the Alphasmart devices are very rugged. I wouldn't necessarily want to spill my coffee on it, but if it takes a tumble I'm not going to worry too much. Some other nice-to-have things that the Neo2 offers include a word count (Ctrl-W), a file-wipe button (Clear File) for those times that a draft is just not worth keeping, a keystroke cheat sheet right on the bottom (flip the device over if you don't remember how to do something), a spell-check button, a basic calculator app, and a built-in thesaurus. None of these are particularly striking compared to a full-fledged word processor, but that's not what the Alphasmart is supposed to be, so it's nice to have them. Also, the battery life is apparently extremely long, running on three AA batteries for months. Not all of the used Alphasmarts come with a USB cable, but I made sure to order one that did, mostly for simplicity and cost savings since the prices seemed the same whether the USB cable was included or not. As of my posting of this blog entry, I've only connected mine twice, both times to transfer text using the "send" button. This basically "types" the contents of the current file to the computer, so you must have a program (like a word processor) open and ready to accept text. Another method of transferring data is to use software that can read from and write to the Alphasmart. Despite the Alphasmart line being discontinued, Renaissance Learning still provides support in the form of downloading that software as well as device manuals. I have the software downloaded but I haven't installed it yet. Some might wonder why I don't simply write on my tablet, especially since I finally got a Bluetooth keyboard for it. In short, I will probably continue to do that too at times, just as I will dictate at times, and at times I will write directly into a text editor running in Linux or Windows while I sit at my desk. However, as mentioned above, the Alphasmart has no Internet connection, and the many distractions that come with online life are left behind if I walk away from my desk with my Alphasmart in hand and my phone on silent. As I was drafting this blog post, I was sitting quietly in my living room while my son was quietly reading Of Mice and Men as part of his homework. There were no distractions other than occasional appearances of our cat, and it did not take me long to write the initial draft of this blog post (of well over 1300 words). If I can manage that kind of productivity on other writing projects, 2016 could be a very good year! And since it is basically a hardware text editor, I can continue writing in Markdown, and perhaps -- depending on what I find out about the Windows software -- I may be able to develop some automation to improve things even more. For example, I might be able to set things up to automatically convert files from the Neo2 to a certain desired destination format. For example, if I start a "file" with a one-line purpose indicator like Dest:Blog, my automated process could convert the file to HTML. The Alphasmart is not perfect, but any issues I've found so far are so minimal that I really have no complaints. What might I improve if I could produce my own? I suppose a better balance would be one thing I would try to resolve, as right now it is definitely heavier on the screen side. A design alternative would be to use AAA batteries instead of AA and install them on the side opposite from the screen, to use the battery weight to counterbalance the other components. Also, unless I'm doing something wrong (quite possible, since I'm still learning), the ability to select text and then delete it by typing replacement text does not work. I have to select the text, tap Delete, and then type the replacement text. Not a big deal, but I type over selected text on the computer all the time so that is a strongly-developed habit that I can't carry over to the Neo2. The password protection feature is a good idea but weakly implemented, so it would be nice to have longer passwords. These are minor irritations at worst, though. Overall, again, I'm quite happy with this device. I do think it will help enhance my writing productivity by moving me back toward what I had when I was younger -- an interface where I can write freely and in just about any decently-lit setting, without any pings or beeps or alert boxes drawing my attention away from what I am composing. It doesn't have the feel of a spiral notebook and pen, but it's vastly more functional and is reminiscent of when I was typing on a typewriter. Finishing work will always be done on a richer interface, but for bulk writing the Neo2 is excellent. Since each "file" can hold 7000 words or more (depending on your typical word length), you could probably write a whole NaNoWriMo novel on one of these! If you have one or plan to get one, feel free to share your thoughts about the Alphasmart line in the comments.